No. 1098: Who Invented the Telephone? Click here for audio of Episode 1098. Today, an old question: who invented the telephone? The University of Houston's College of Engineering presents this series about the machines that make our civilization run, and the people whose ingenuity created them. Ask who really invented the telephone, and you may get the name of a German, Philipp Reis, not Alexander Graham Bell. The common wisdom is that Reis's telephone was only marginal, while Bell's phone really worked. Now Lewis Coe rethinks the priority question in his book, The Telephone and its Several Inventors . Speak against one diaphragm and let each vibration "make or break" the electric contact. The electric pulsations thereby produced will set the other diaphragm working, and [it then reproduces] the transmitted sound. Only one part of Bourseul's idea was shaky. To send sound, the first diaphragm shouldn't make or break contact. It should vary the flow of electricity to the second diaphragm continuously. Reis used Bourseul's term, "make or break," but his diaphragm actually drove a thin rod to varying depths in an electric coil. He didn't make and or break the current. He varied it continuously. Bell faced the same problem when he began work on his telephone a decade later. First, he used a diaphragm-driven needle, entering a water/acid solution, to create a continuously variable resistance and a smoothly varying electrical current. Bell got that idea from another American inventor, Elisha Gray. Of course evaporation and immobility both make a liquid pool impractical. 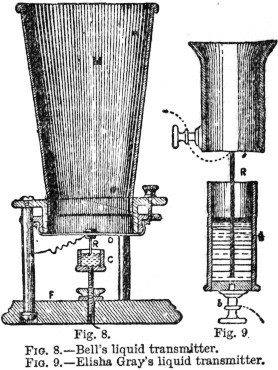 Bell soon gave it up in favor of a system closer to Reis's electromagnet. Still, it's clear that Gray's variable resistance pool had pointed the way for Bell. And so we wonder, was Bell also influenced by Reis's invention? 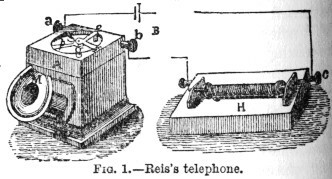 Reis died two years before Bell received his patent. He was only 40, and he never did get around to seeking a patent for his device. Reis's phones were tricky. The diaphragm was too delicate. A German company produced them with inconsistent results. Some worked well. Some transmitted only static. Reis's phones were demonstrated all over Europe. One was demonstrated in Scotland while Bell was back there visiting his father. We don't know if Bell saw it. However, he could hardly have been unaware of Reis's work. Still, we don't want to deny Bell's brilliance. He produced a robust and viable telephone, and he had the force of personality to sell it to a skeptical public. But to do that, he did what all inventors do. He built on the combined wisdom of others -- just as Reis had built on the work of Bourseul before him. The very word priority cheats all but one person of credit. In fact, we must thank Bourseul, Reis, Gray, Bell -- all of them. For great inventions are always the gift of many people, not just one. Coe, L., The Telephone and Its Several Inventors . Jefferson, NC: McFarland & Company, Inc., Publishers, 1995. I am grateful to Judy Myers, UH Library, for suggesting the Coe book and providing me with a copy of it. For more on the invention of the telephone, see Episode 748.